We are a family-owned & operated, fully insured business that strives to live out our passion for being outdoors, landscaping and serving people. Doing so while working to portray our style of modern simplicity & landscaping that compliments it's natural surroundings. Native Edge Landscape is not your typical landscape design firm. Founded in 2008 and grown from seed right here in Austin, Native Edge is a full-service landscaping business committed to responsibility—to our environment, our community, and our clients. We create thoughtful landscape designs fully customized to our clients’ lifestyles and budgets, and we take care of every last detail to bring them to life and maintain them, using only the most sustainable practices and exclusively native plants. We strive to get to know our clients to the point where we can deliver an exterior space that expresses their personality and lifestyle. If you are looking for an outdoor design that blurs the transitions between interior and exterior spaces while maximizing its beauty and usability, then you will find us to be a great fit for you. We understand that most people meet with more than one design firm or contractor before signing a contract. Whether you are just starting to think of your yard or it has been on your mind for years, contact us to schedule an initial consultation to discuss the potential of renovating your exterior space. Robert Leeper Landscapes has been designing and installing landscapes and gardens since 1999. We specialize in landscape designs that are right for the style of your home, use as little water as possible, and incorporate your needs. Each design is customized for your project. We design landscapes of all styles: modern, traditional, edible, and more. We start with a consultation. If needed, we can create a design on paper that is a road map for your project. We install your design and can help maintain it so that you can protect and grow your investment. 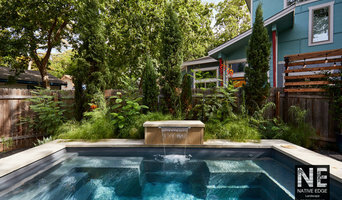 Austin Area Landscape Architect 7x Best of Houzz Winner! 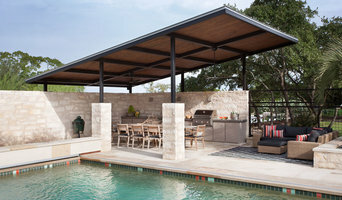 OES is a boutique design and build studio based in Austin, TX, specializing in modern landscapes, custom steel work, and unique furniture for residential and commercial projects. 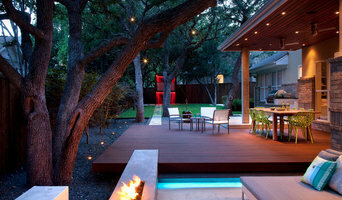 Articulated Design Landscape Architecture is a design-build firm located in Austin Texas. We offer complete design-build services from conceptual and schematic design through final construction. Our diverse background in landscape architecture, art, ecology, horticulture and construction, provides the framework for our design approach. It is our goal to work closely with our clients throughout the design process in order to create site-specific spaces that respond to their individual lifestyles. Pearson Landscape Services is a designer construction and maintenance firm concentrating in total landscape creation and care. From the design process through production and post-installation, our designer and lead supervisors work meticulously with our clients to see their aesthetic vision come to life. Through constant communication between homeowners, our designer and construction teams, Pearson Landscape Services adheres to implementing premium designs and materials in order to generate environmentally sound and stunning projects. To ensure the quality of our projects, we also provide continuing maintenance so that the enduring vision of our customers not only looks and feels good for today, but persists through their vision of tomorrow. We are a design / build company specializing in luxury outdoor living spaces! We offer complete landscape design and installation services. Blazek Landscapes, LLC is a privately owned landscaping company providing residential and commercial design and installation of outdoor living spaces in Austin and surrounding areas. We strive to achieve a superior product for our customers through our knowledge of landscaping materials and landscape design and the implementation of these services. We are a fully licensed and insured company and have over 12 years experience designing and installing landscapes in Austin, Lake Travis, Westlake, Lakeway, Tarry Town, Spicewood, Bee Cave, Dripping Springs, Cedar Park, and surrounding areas. The Garden Design Studio has been creating inspired landscapes all over Texas for more than 20 years, specializing in custom, high quality design and construction. Here at The Studio, we aspire to take our clients' visions and turn them into environments that are uniquely theirs to enjoy and live in. Landscape Architecture aims to create spaces to be lived in, enjoyed and experienced. As Landscape Architects and builders, The Garden Design Studio designs, installs, and maintains one-of-a-kind outdoor living environments. Our team consists of highly skilled Landscape Architects, designers, craftsmen and gardeners whose work has garnered frequent press and awards. We are a Design / Build firm, taking projects from conception to completion, but we are available on a design-only basis for clients who are too far away for our implementation services. We work all over Texas and we enjoy working on a diverse range of projects - even to maintenance after your project is completed - our team of designers and craftspeople will attend to every detail. Public or private, large or small, near or far – we love what we do and we think it shows. Please call us today to get your new project started! B. Jane Gardens is a full service Landscape Design + Build Group providing custom design and consultation work, high quality and efficient turnkey installation, and detailed garden maintenance in Austin, TX. Building gardens locally for over a decade, we are a team of talented designers, stone masons, concrete and metal workers, carpenters, arborists, irrigation and lighting specialists, gardeners, and pool builders. With a strong background in Sculpture and Landscape Design + Construction, we appreciate the importance of solving problems creatively, turning difficult situations into aesthetically pleasing and highly functional assets. Our goal is to provide our clients with unique outdoor living spaces designed to fit their lives. Austin-based landscape design company focused on designing landscapes and outdoor environments that add value to your property. Things people have said about Brian: he's reliable, easy to work with, "he won't leave you hanging like a lot of contractors and designers in Austin do these days", he's got "greater design vision than I could have created myself", our clients are repeatedly impressed; check out our reviews to see what they've said! Double B Design provides unique design solutions because they bring talent, passion, a vision and a strong design skill set to your project. Every design is tailored to your specific project, to mold to your needs. Contact us now with any questions or to inquire about a new project. We are happy to be your helpful resource! Double B Design provides a premier experience because we are able to provide comprehensive design solutions harmonious with the architecture that in turn add value to your property. At Verdi, landscape design is our passion. We partner with our clients to design and implement unique outdoor spaces. A design might require historically used plants for a home built in the early 1900’s or modern components for a mid-century building renovation. The aspects of our designs vary as widely as our client’s needs and imaginations. For over a decade we’ve been called upon by homeowners to help with projects both large and small and we look forward to helping you with yours. Passionate about design. Passionate about results. For over 30 years, Southern Landscape has designed and delivered award-winning landscape and outdoor living dreams to discriminating clients in Austin, Texas and the surrounding Hill Country. No matter what type of landscape and outdoor living project you are looking for, Southern Landscape is passionate about delivering the highest quality of service in the industry, making the design/build process enjoyable, and ensuring outdoor your living dream becomes a reality. A professional design-build contractor and winner of multiple Texas Excellence in Landscaping and National Landscape Awards of Excellence, Southern Landscape has designed and delivered award-winning landscape and outdoor living dreams to residential clients in Austin, Texas and the surrounding Hill Country since 1982. Call us today at (512) 263 -8450 or email us at info@southernlandscape.com to learn how Southern Landscape can make your outdoor living dream a reality! Eden Garden Design is an full-service landscape design + build firm specializing in residential and commercial projects. 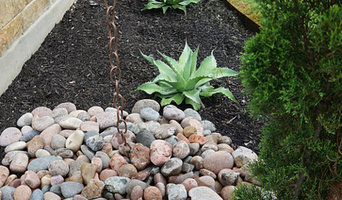 Our designs emphasize native and adapted plants and the highest quality hardscape materials. We create landscapes that will flourish in the central Texas area - smart designs that are new and unique, yet all based on sustainability. The work of this outdoor professional includes most everything surrounding a home's exterior. A landscaping architect can even work with the home architect to choose the right spot for your Jonestown, TX house. From there the Jonestown landscaper will develop preliminary concepts for your front or backyard design based on individual needs including the climate and activities that will take place, as well as layouts and planting plans. Landscape architects will also design any structures or outbuildings that will be added to the space. Any grading changes that will be added to the yard are also the responsibility of the architect. This includes any drainage modifications. An engineer can also be responsible for these tasks, but licensed Texas landscapers are fully capable. Like building architects, they will produce preliminary concept drawings as well as detailed construction documents and planting plans. Three-dimensional renderings and illustrative plans are all supplementary. A Jonestown landscaping designer generally will have ecological, aesthetic and technical training, which helps them maximize the potential of your outdoor space. Keeping in mind both style and functionality, garden designers analyze your architecture and yard to produce a plan that may or may not include location and materials for walkways, patios, water features, fences, garden aspects and more. In addition, a landscaper in Jonestown, TX will carefully assess your geographic region to choose plants, trees and flowers that will flourish naturally, as well as address concerns such as drainage, screening and soil conditions. Certain landscape designers only help with the planning portion, while some may deliver the plans and then oversee a hired landscaping contractor. Others — typically following a design-build approach — take care of both the design and all aspects of the landscape architecture and construction. Find a Jonestown landscape architect on Houzz. Narrow your search in the Professionals section of the website to Jonestown, TX landscape architects and designers. You can also look through Jonestown, TX photos to find a space you like, then contact the professional who posted the photo.